National Progression Awards (NPAs) assess a defined set of skills and knowledge in specialist vocational areas, linked to National Occupational Standards. 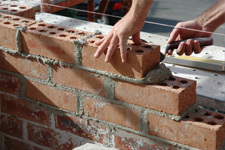 The NPA in Construction — Bricklaying at SCQF level 5 introduces learners to general workplace health, safety and welfare; productive work practices; and a range of bricklaying tasks. These include half-brick walling, one-brick walling, cavity walling, block walling, simple arch construction, and simple decorative brickwork. This NPA develops knowledge and understanding in construction; practical, technical and transferable skills; oral, written and evaluation abilities; resource management; problem solving and planning; and organisational and communication skills. The qualification is available through schools, colleges and training providers. The NPA Construction — Bricklaying at SCQF level 5 consists of two mandatory units and eight optional units (minimum 60 SCQF credit points). Assessment of this award will be a combination of practical and knowledge assessments under closed and open-book assessment conditions. It is recommended that centres refer to the assessment and evidence requirements for each unit. Training Assessment Programmes (TAPs) are available for this qualification.